Bayfield (111 miles) - Enjoy a tour from the Apostle Islands Cruise Service or Madeline Island Ferry Line on Lake Superior, where you you&apos;ll see beautiful natural scenery, historic lighthouses, sea caves and marine wildlife. Visit Trek & Trail for your Lake Superior kayak adventure or biking needs. Call (800) 323-7619 for more information. Boulder Junction (18 miles) - Visit the Musky Capital of the World for their annual Musky Jamboree Arts & Crafts Fair and Antique Auto Show in August. 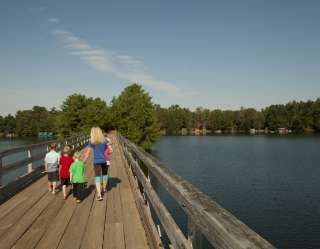 Or, take in the beautiful view from Cathedral Point on Trout Lake. For more information, call the Boulder Junction Chamber at (715) 385-2400. Eagle River (29 miles) - Check out the Snowmobile Capital of the World, the largest inland chain of lakes in the world or attend Cranberry Fest the first weekend in October. Call the Eagle River Chamber at (800) 359-6315 for more information. Fifield (38 miles) - Take a drive to the Smith Rapids Covered Bridge located off Hwy 70 West. Timms Hill (54 miles) - Timms Hill is the highest point in the state of Wisconsin, with an elevation of 1,951 feet (595 m) above sea level. It is located in north-central Wisconsin in the Timms Hill County Park in Price County at 45 degrees 27&apos;04" north latitude, 90 degrees 11&apos;42" west longitude. While Timms Hill has the highest elevation in the state, Rib Mountain has the largest height differential from the surrounding landscape. Timms Hill is located less than a mile south of Highway 86, midway between the towns of Ogema and Spirit, approximately 23 miles west of Tomahawk. Lac du Flambeau (15 miles) - Tour Waswagoning, a 20-acre outdoor re-created Indian village, or visit the George W. Brown, Jr. Ojibwe Museum & Cultural Center. For more information, contact the Lac du Flambeau Chamber at (877) 588-3346. Manitowish Waters (25 miles) - Tour the Cranberry Marshes, July through October. For tour information, call the Manitowish Waters Chamber at (888) 626-9877. Mellen (90 miles) - Enjoy the spectacular waterfalls at the scenic Copper Falls State Park. For more information, call (715) 274-5123. Mercer (30 miles) - Stop in and visit the Loon Capital of the World. The Annual Loon Day, a large craft show that features more than 200 artists and crafters, is a great day trip in early August. For more information, call the Mercer Chamber at (715) 476-2389. Park Falls (35 miles) - Ride more than 200 miles of ATV trails in the Chequamegon National Forest. Rhinelander (25 miles) - Attend the annual Hodag Country Music Festival in early July or spend the day checking out the local logging museum. Call (800) 236-4FUN for more information. St. Germain (15 miles) - Stop in and see the historic race sleds, trophies, clothing and the Ramstad Photo Collection at the Snowmobile Hall of Fame & Museum. For more information, call (715) 542-4488. Sayner (15 miles) - The Vilas Historical Museum is a great place to see antique snowmobiles, dolls, fishing guides, tools, household items, clothing, military memorabilia and more. For more information, call (715) 542-3388. Tomahawk (30 miles) - Mid-September the Tomahawk Fall Ride for the Muscular Dystrophy Association takes place. Call the Tomahawk Chamber at (800) 569-2160 for more information.